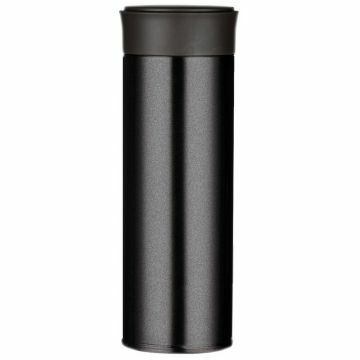 Thermos bottle with a reflective coating - makes you visible in the dark! Finns know something about darkness. Last year, there were only 12 hours of sunlight during november in the capital Helsinki! Magisso Visibility Bottle is a stainless steel vacuum bottle that keeps your drink hot or cold on the go. The Visibility Bottle comes with a reflective coating that makes you visible in the dark. Stay safe and be visible when on the run, walking the dog or strolling around with your children. 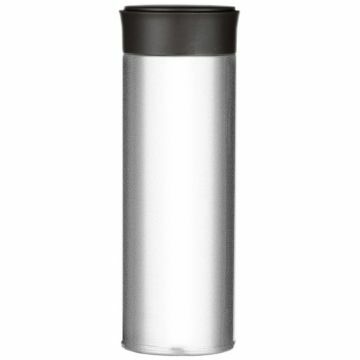 This stainless steel double wall insulated mug keeps your drink warm for 6-8 hours or cold for up to 12 hours. The bottle comes with a tea filter if you wish to brew tea in it. The volume is 350 ml. The Magisso Visibility Bottle is the first BPA free reflective hydration bottle designed to keep you safe and visible in a low-light environment. Choose from two colours: black and pearl white. Life is filled with small everyday problems: how to keep your drink cool in the sun, why making loose tea is always such a mess – and where the heck is your dish cloth? Sometimes it only takes one tiny thing gone wrong to derail your whole day. Magisso wants to keep you on track and make it easier for you. Best solutions grow from personal frustration. When Magisso was established in 2008 in Helsinki they had a burning passion to make meaningful design and international business. And they knew nothing about design and international business. Really. Over 20 design awards later Magisso still thrives from that same passion. For Magisso every obstacle is an opportunity. They are driven by desire to solve problems and create beautiful designs. Whenever you discover a problem already solved it’ll make you go: “Wow! Why didn’t I think of that?” and share it with your friends. Sharing positive experiences creates a circle that inspires us all – and makes life better.